Dubai, UAE, July 31, 2017: Skyline University College, Sharjah has signed a memorandum of understanding (MoU) with IDP Education-UAE as an Authorized Testing Venue of IELTS Examination for Academic and General Modules on July 30, 2017 at SUC campus. SUC Head of Academics Dr. Mohammad Hasan Saleh Inairat and IDP Education Ltd. Country Director for Gulf States Ms. Rashi Bhattacharya signed the MoU on behalf of their respective organizations. The MOU was coordinated by the head of SUC English Language Center Dr. Victoria Verna. This partnership was made with the aim of providing students with the services required in their higher education pursuit and opening an opportunity to people who dream of migrating abroad. 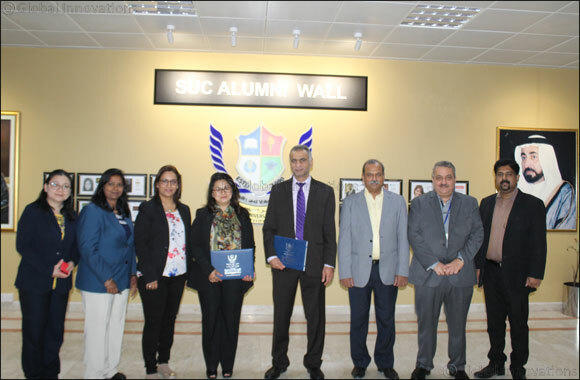 In line with SUC’s vision of academic excellence, this partnership highly benefits the students with global competitiveness, comprehension, and aptitude to meet the requirements of the world. SUC conducts workshops and training to help students prepare for the examination and also offers a year-round IELTS Preparatory Programs under the dedicated SUC English Language Center. SUC and IDP believe that this partnership’s main goal is to deliver the highest quality of services to everyone, opening global possibilities, and helping aspiring students achieve their goals and dreams. SUC Academic Year 2017-2018 commences on September 2017.